Now you know the Portuguese word is different, yet you refuse to use it? Why? Interesting.... keep up the great work!! @philippa: Thanks! 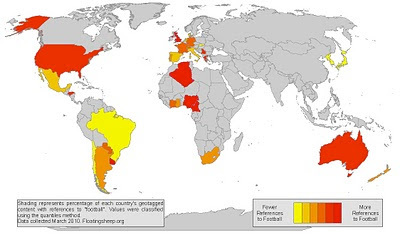 We understand the problems with using just "football" in these maps - as both Australia and the USA present problems. We've addressed some of these language differences in a previous post that Mark linked above. In this series, however, we were looking for a more uniform way of measuring, and so we chose the most universal term for the game - football. That's a fascinating way to look at the World Cup data.